Just North of Newcastle, coast-side, in a tiny village called Seaton Sluice sits a Hall. I have seen it from the road many times and enjoyed the uncluttered view. A lawn of plain green rolls out in front of the elegant house, broken only by a drive that ends with an understated stone gateway. On the day I went to Seaton Delaval Hall a sea mist had descended to play tricks with all but the brightest colours. It altered distance, challenged perspective and diffused light with billow after billow of wafting water vapour. The house itself poked out of the grey, confidently presenting a grand image in the Northumberland countryside. Somewhere inside was an exhibition of artwork by Canadian artist Kelly Richardson. Pillars of Dawn straddles two sides of a room called the Saloon. The room was raw with history having been gutted by fire at some stage in a sorry past. 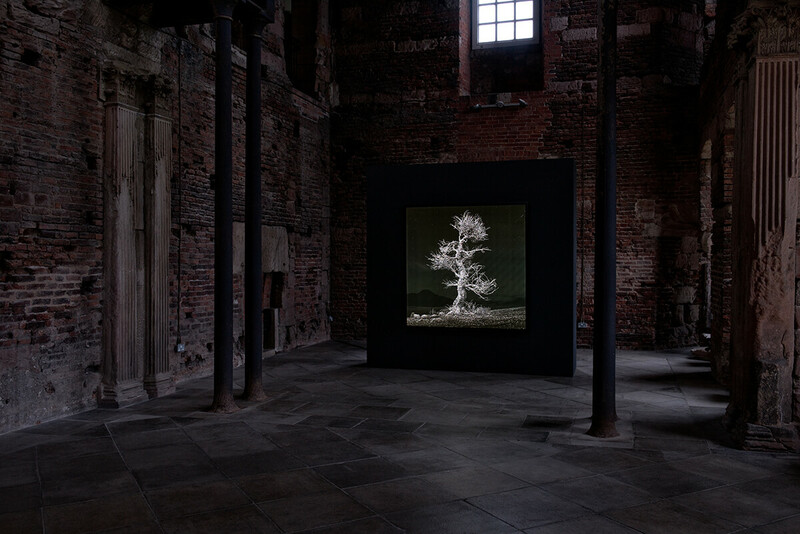 The damp smell of sandstone suited the bareness of the room, and the room suited the two large artworks of silver trees that faced each other. Missing work from the broader project didn’t seem to matter here; these two tree portraits could tempt any eye to stop and look, they also flanked either side of a walkway through to grounds beyond that couldn’t be seen through an open gateway that introduced a field full of mist. As I stopped and looked I couldn’t help wondering about trees in photographs and trees in landscapes. Many photographers return to the same landscapes time and time again tirelessly reworking a reality draped in different light. Kelly Richardson creates her landscapes and builds her trees in a way that harnesses a belief in the photographic. The trees appear real at first glance, solarised photographs perhaps? They are draped in the composition and a silvery monochrome that belongs in the palette of the photographer more than the artist. But these landscapes are fictional, they are composed of fragments of reality, drawn from real places such as nearby Whitley Bay, and styled into a three dimensional digital landscape that is then posed for the ‘camera’ and captured as a two dimensional still. The trees themselves are composed from tiny silvery, digital crystals that invite close inspection. The result is compelling. 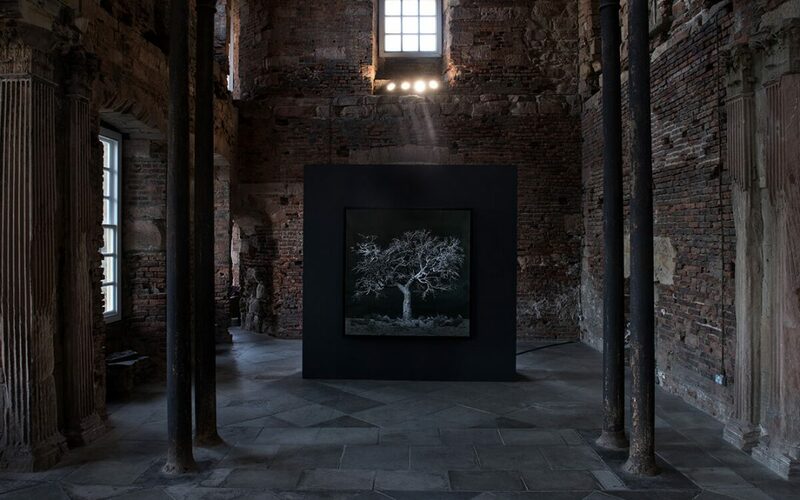 The landscape that surrounds the tree deep within each image responds to actual light, becoming more visible as daylight retreats across the sandstone gallery back through windows to allow the cool Northumbrian twilight then moonlight to filter in. I can’t help but wish there was a midnight viewing. I heard mention of bats living deep within the sandstone heights of the Saloon. Sleeping soundly now. Richardson appears to be a location scout for landscapes that cannot be visited. Ansel Adams photographed natural content to create beautiful monochromatic images that he would use to support the campaign to preserve landscapes of the American West but in doing so advertised wilderness and triggered photographic pilgrimages to the sites where his tripod stood. Other photographers such as Darren Almond chose moonlight to illuminate landscape and tree-scapes that were captioned as place and emphatically photographic. Here there is no place, yet every place; a collision of thoughts about the importance of landscape delivered with an aesthetic expertise that equals any photograph of some beautiful landscape. Kielder Forest sits near to the Hall under a sky that is prized for its clarity and star gazing potential. There are hints in this work about a love of the English North Eastern landscape that geographically links the work to this region. The fear of losing wilderness and a belief in wilderness preservation is an international concern, in the western world at least, and this digitally styled, fictional work suits these digital times as much as Adams’ approach in analogue days gone by. Both prophetic and reflective, this work reminds us how important it is for our visual delight to be awakened so that we engage with the notion of landscape through image in thoughtful ways about more than one place. Kelly Richardson’s Pillars of Dawn will be exhibited at Seaton Delaval Hall until 15 July 2018 , at Southampton City Art Gallery until 6 October 2018 and at Northern Gallery for Contemporary Art 27 October – 2 December 2018.